Late June in Callabasse Haiti, on the same grounds of The House of Blessings, the doors were open for the first time to The School of Blessings. The School of Blessings is a vocational school in partnership with the House of Blessings. The goal at the school is to partner with people through business and education to break the cycle of poverty. Through our classes we aim to give people a tool that will not only help them mend their own lives but also give them a way to take an active role in the rebuilding of their community. This school was born out of the desire to follow Jesus and relieve some of the burdens of our closest neighbors. It was created with the resolute belief that we could create something together that would change the trajectory of people just like you and me living in very different and often very difficult circumstances. Sure – we could give a gift or make a donation, and that could possible relieve an immediate need. Certainly, in times of emergency a bandaid to stop the bleeding is a necessary and good. But as we look to change the future and set people free from spiritual, mental and physical poverty, the leadership at the School of Blessings were compelled ask what can be done to give the best chance of sustainable positive change. That’s where this project was born. More than two thirds of Haitians lack formal employment, and more than 50% of the population lives on less than $1.25 a day. Without employment, those living in poverty have little chance to better themselves. Yet, not only are there jobs available in Haiti, there is actually a shortage of skilled labor. To get started, we worked to identify the two biggest job skills in demand in Haiti. We quickly identified English and sewing as our first two courses. The demand for English in Haiti, especially in the capital of Port-au-Prince, is overwhelming. Knowing English greatly improves the chances of finding long-term, meaningful employment, which is important everywhere, but especially in Haiti. Learning English opens doors for people in developing countries. It opens the door to books in English and a vast wealth of educational material, it opens the door to relationships and international business. 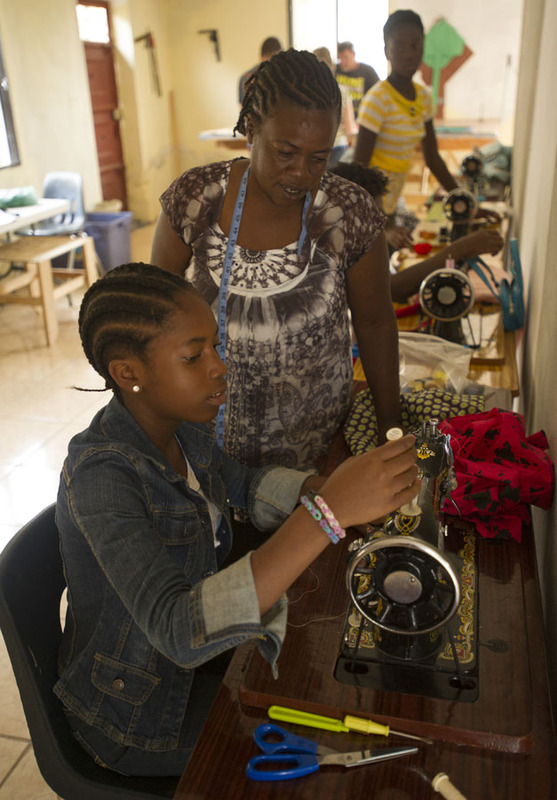 Likewise, by teaching a trade skill like sewing, we’re able to give Haitians more than the opportunity to earn money, we give them the pride that comes with the ability to become financially self-reliant and the confidence to overcome the tremendous obstacles many people around the world face. The English classes went remarkably well. There were a few lesson we learned about how to administrate and register students. Each student is responsible to pay their own way to the classes and the money from those registrations goes to pay the cost of the teachers salaries. We finished the English classes strong and graduated 11 students with a basic understanding of the English language. Many of those students are continuing in our 201 class beginning in late August. The sewing classes began with 8 students broken up into 2 classes, using the 4 treadle machines purchase through the generous donations of our sponsors. Through out the first semester we not only kept every student, we actually managed to squeezed in a couple more girls. We were over capacity and still have a long waiting list of people wanting to take the class next session. As the sewing class went on, since all of our students were young ladies, we moved away from traditional vocational training and began to model it more like a summer elective for the younger girls in the area. There are a couple young ladies who have shown a lot of potential and could do quite well as a seamstress, but for the first session we moved away from job training and toward a model that looks more like a school of arts. Through the courses (and moving forward) we began to use both the sewing and English classes as a means to not only teach skills in the textbook, but also as a means to teach things like critical thinking and other job related skills (things like time management, problem solving, and integrity). Discipleship and mentoring is at the center of it all of all we do in the school.